When I was schmoozing around academia in 1992 on a quest for Microship development facilities (eventually landing at UCSD), I was sorely tempted by the MIT Media Lab. Although open Cube workspace in an urban environment was a bit overwhelming to contemplate, I’ll always wonder if it would have indeed been the wiser choice… the people there are simply amazing. I was invited to visit by Nicholas Negroponte, and spent a couple of days having my mind blown by wizards various… and this little snippet in FRAMES is an echo of that brief glimpse into another world. Steven Roberts visited the Media Lab in mid-July together with BEHEMOTH (Big Electronic Human-Energized Machine… Only Too Heavy), the third version of his nomadic system. Steve has logged more than 17,000 miles while publishing stories on adventure and technology. 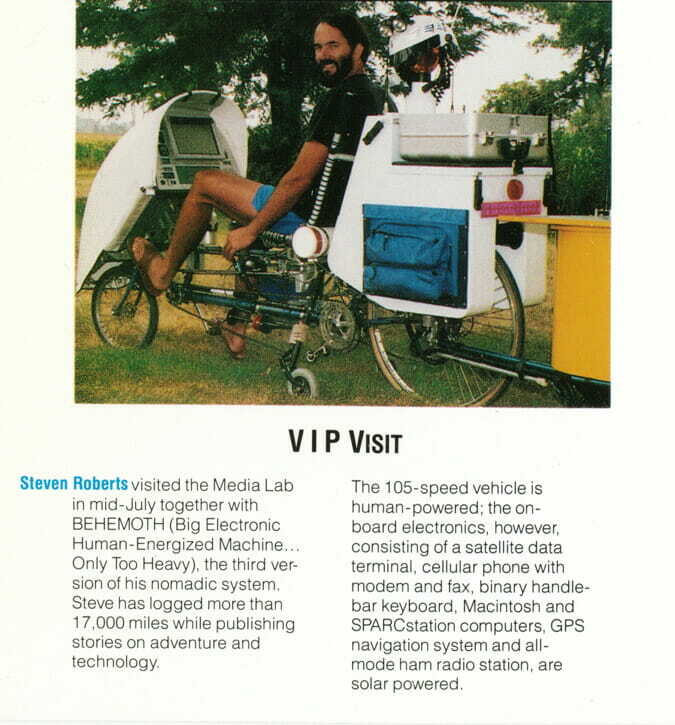 The 105-speed vehicle is human-powered; the on-board electronics, however, consisting of a satellite data terminal, cellular phone with modem and fax, binary handlebar keyboard, Macintosh and SPARCstation computers, GPS navigation system and all-mode ham radio station, are solar powered.